A Gastronomic street food festival with live music on every Saturday night for the next couple months, hosting 15 of the best street food vendors. Londoners love a market. Londoners love a festival. 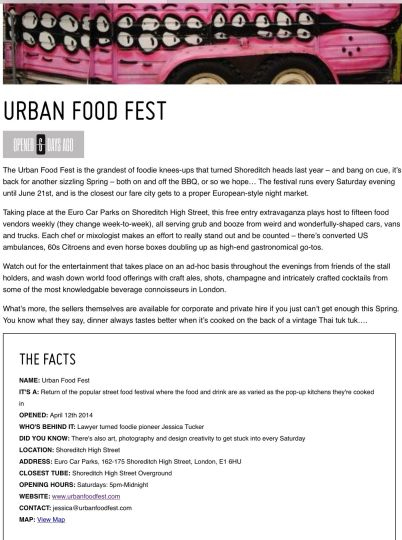 So we know Londoner’s will love the new night market, Urban Food Fest in Shoreditch. 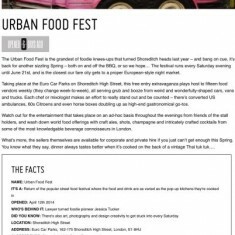 Taking over the car park on Shoreditch High Street, Urban Food Fest is set to be the best night market in town – you should never stay in on a Saturday, after all. As well as a vibe that only Londoners can create, Urban Food Fest has solved our Saturday night need of eating, drinking and dancing all in one East London trendy spot. The Urban Food Fest is the grandest of foodie knees-ups that turned Shoreditch heads last year – and bang on cue, both on and off the BBQ, or so we hope… The festival runs every Saturday evening, and is the closest our fare city gets to a proper European-style night market. 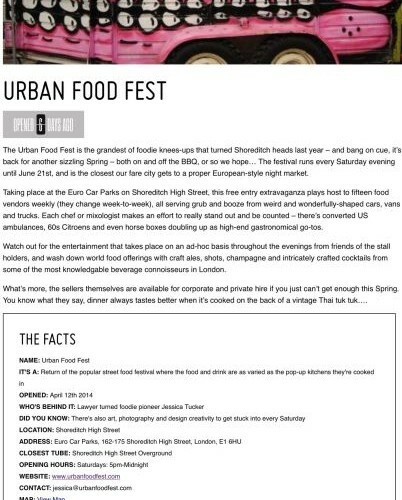 Taking place at the Euro Car Parks on Shoreditch High Street, this free entry extravaganza plays host to fifteen food vendors weekly (they change week-to-week), all serving grub and booze from weird and wonderfully-shaped cars, vans and trucks. Each chef or mixologist makes an effort to really stand out and be counted – there’s converted US ambulances, 60s Citroens and even horse boxes doubling up as high-end gastronomical go-tos. Watch out for the entertainment that takes place on an ad-hoc basis throughout the evenings from friends of the stalls, and wash down world food offerings with craft ales, shots, champagne and intricately crafted cocktails from some of the most knowledgable beverage connoisseurs in London What’s more, the sellers themselves are available for corporate and private hire if you just can’t get enough this Spring. You know what they say, dinner always tastes better when it’s cooked on the back of a vintage Thai tuk tuk…. The Facts NAME: Urban Food Fest IT’S A: Return of the popular street food festival where the food and drink are as varied as the pop-up kitchens they’re cooked in WHO’S BEHIND IT: Lawyer turned foodie pioneer Jessica Tucker DID YOU KNOW: There’s also art, photography and design creativity to get stuck into every Saturday.